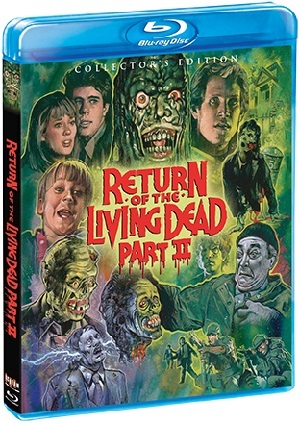 A sequel to Dan O’Bannon’s 1985 cult horror-comedy favorite The Return of the Living Dead, 1988’s appropriately titled Return of the Living Dead Part II is a tired retread that ups the silliness quotient, forgets the horror almost entirely and presents precious few laughs that could be construed as being purely intentional. 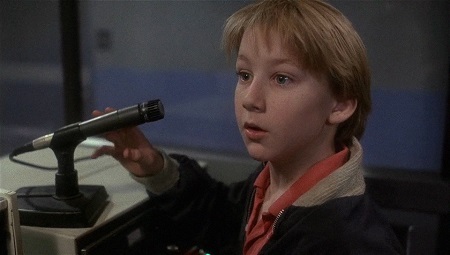 It’s something of a mess that basically recycles the plot (and two of the actors, James Karen and Thom Mathews) of the original while throwing a precocious kid (gamely portrayed by Michael Kenworthy) into the mix more because it can than because the script knows exactly what it wants to do with him. Some solid gore effects aside, this film is something of a moderate disappointment, and it’s hard to imagine even die-hard genre fans who adore the original have much that’s all that positive to say about this unfortunate misfire. 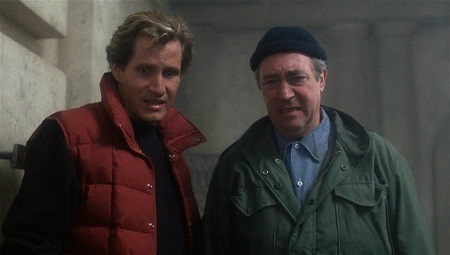 In some ways it just feels like writer/director Ken Wiederhorn failed to understand what made O’Bannon’s original so popular with critics and audience alike. Even though he was no stranger to zombie madness (the filmmaker helmed 1977’s moderately creepy underground favorite Shock Waves with Peter Cushing), there is no balance to this screenplay, the comedy elements so overwhelming the film almost feels like some sort of Airplane! or Hot Shots style parody more than it does anything else. Problem is, almost none of the jokes land, and those that do come perilously close to feeling unintentional. 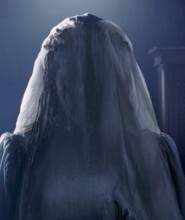 The whole thing is like some absurd direct-to-video cash-in and not a meticulously planned sequel to a surprise cult favorite that took three full years to see the light of day, each individual element coming up continually short as events make their way towards their invevitable conclusion. The plot once again follows the release of a mysterious green gas from to accidentally misplaced military canisters containing what appear to be containing gruesomely decomposing human bodies, the result of which causes unfortunate undead transformations for the humans unlucky enough to breathe it in and the raising of brain-eating zombies from the local cemetery. This time out, a small suburban housing community is the one under assault, a group of various young adults and an alcoholic doctor (as well as that aforementioned plucky kid) the only ones standing between this carnivorous horde and the end of humanity as we know it. Considering how much I really like 1993’s inspired Return of the Living Dead Part 3, it honestly makes me a little sad I don’t care for this second chapter in the popular horror series more than I actually do. But Return of the Living Dead Part II just isn’t very good, lacking in the inspired, go-for-broke blood-soaked lunacy of O’Bannon’s film, Wiederhorn instead offering up a tired retread that’s decidedly forgettable. It just isn’t very good, and while the completist in me is happy to now own it on Blu-ray, that doesn’t mean I’m recommending anyone else add it to their personal collections without giving it a look beforehand. Return of the Living Dead Part II is presented on a 50GB Blu-ray MPEG-4 AVC Video with a 1.85:1 1080p transfer. This Blu-ray features an English DTS-HD Master Audio 2.0 soundtrack as well as a Dolby Digital 2.0 track that includes alternate audio selections that differ from the theatrical version. The disc includes optional English subtitles. This disc is loaded. Even if this sequel isn’t particularly good, that doesn’t mean Scream still hasn’t gone all out giving this cult curiosity a great deal of respect. For fans, these are extras worthy of being cherished. Return of the Living Dead Part II isn’t good. 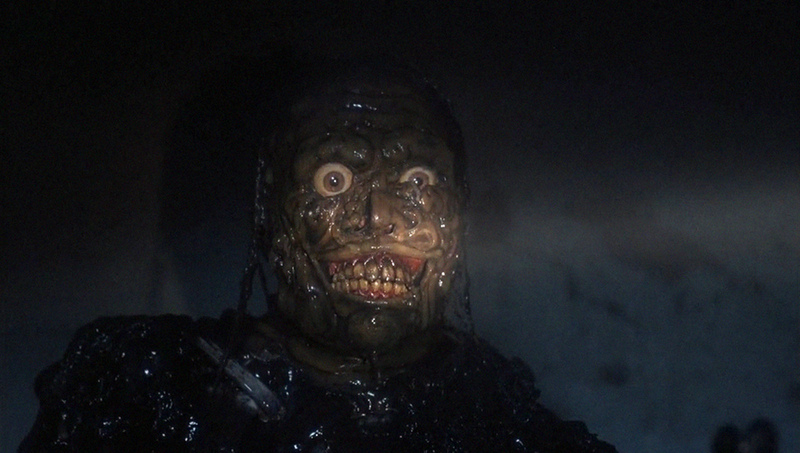 It lacks the charm, scares, creativity, witticism and vulgar imagination of the beloved 1985 original or the aggressive and inspired gender-flipped nastiness of 1993’s hugely underrated third chapter Return of the Living Dead Part 3. However, Scream! Factory’s Blu-ray presentation, which restores almost all of the film’s original audio, features a superb visual presentation and comes loaded with a bevy of incredible bonus features, is a real gem for fans of the series. While newcomers are urged to rent before buying, those already in the bag for this sequel should pick this disc up right away.